Be swept away by the memorable music from The Lion King, Mary Poppins, Robin Hood, Fantasia, and Pirates of the Caribbean. 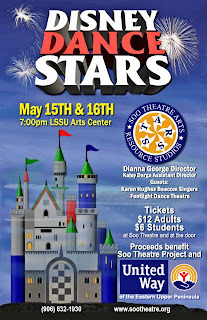 The magical music of Disney takes center stage Friday and Saturday May 15th and 16th as the students of the Soo Theatre Arts Resource Studios (STARS) present Disney Dance STARS at the LSSU Arts Center at 7:00 p.m. both nights. Ms. Dianna George is the Director of Dance at STARS. Kaley Darga is Assistant Director. Over 250 students of ballet, ballroom, hip-hop, jazz, and tap will keep the show moving with some of the best-loved melodies of our time. Guest performers include the Karen Hughes Beacom Singers as well as the Footlights Dance Theatre, a cadre of highly skilled dancers who will be touring the Eastern Upper Peninsula this summer. The show will dazzle you with colorful costuming and the LSSU Arts Center’s state-of-the-art technology in lighting and sound. Performers range from incredibly cute 3-year-olds to teens and adults who have been honing their talents for years. Showtime is 7:00 p.m. both nights. Tickets are $12 for adults, $6 for students, and can be purchased at the Soo Theatre office (534 Ashmun Street in Sault Ste. Marie, Michigan) or at the door. Soo Theatre Arts Resource Studios (STARS) is a community arts center offering instruction in music, dance, theater, visual arts and yoga for students of all ages. STARS is a program of the Soo Theatre Project, housed in the historic Soo Theatre complex. For more information on the project, shows, classes, and lessons, call the STARS office at (906) 632-1930 or visit the website www.sootheatre.org. The Soo Theatre Project will be holding Oliver! auditions later this month. Directors Dave Rhinard, Karen Hughes, and Dianna George will hear singers on Sunday, April 19 from 3:00-6:00 pm and Monday, April 20 from 5:30-7:00 pm at the Soo Theatre, 534 Ashmun Street. 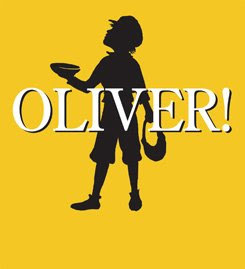 This award-winning musical, adapted from the book Oliver Twist by Charles Dickens, will be performed July 9-12, 2009 on the Soo Theatre stage. There are lots of roles to fill in this show including 6 male leads, 4 female leads, multiple secondary character roles, a children’s chorus of orphans (ages 8-11), pickpockets (ages 11-14), and an adult chorus. For more information on the show, see Oliver! – Synopsis, Scenes, Songs, and Cast. Soo Theatre asks auditionees to prepare one verse of a musical theatre song and to bring sheet music for the accompanist. Memorization is strongly encouraged, especially if seeking a leading role. Children auditioning for the chorus may sing a verse of a children’s song if they do not have a song from a musical. Soo Theatre Project is continually seeking behind-the-scenes volunteers for backstage work, set construction, costumes, publicity, etc. Stop in or call to let us know if you have another area of interest and would like to be a part of the 2009 summer season. Please call (906) 632-1930 and/or email stars@lighthouse.net for more information. There are many roles that need to be filled. Don't be shy! Come out to audition for Oliver! at the Soo Theatre Project!